and a train to "choo-choo"? Audrey's birthday invitations are out the door! I'm committed to a date. I have been thinking about this party since January as I knew I needed to plan ahead to pull it off with a big Spring vacation in the middle of things. 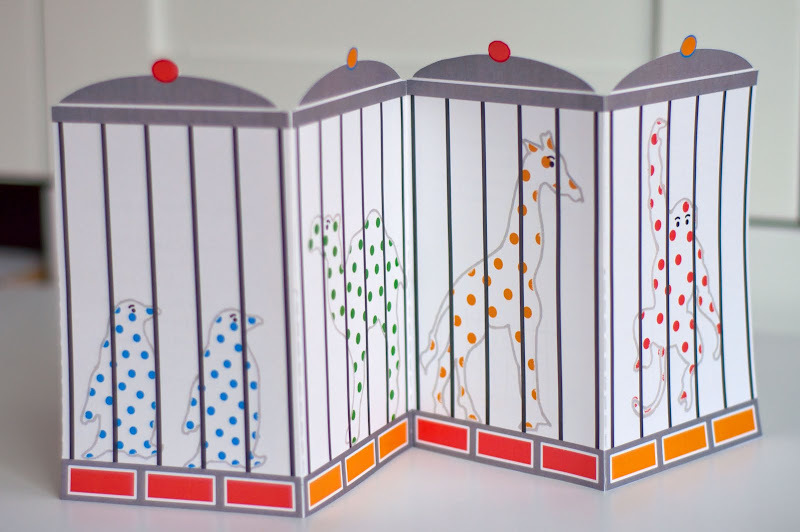 I can't remember how I landed on the zoo idea, but I think it was a combination of having fun with the animals at Scarlett's Modern Farm party last Fall, finding the cute Michael Miller "Kids Zoo" fabric for Audrey's dress, and imagining an accordion fold card. And of course our zoo includes many of Audrey's favorite things: animals, cotton candy, a train, and a carousel. I enjoyed the zoo too when I was little, though I didn't get to go as often. 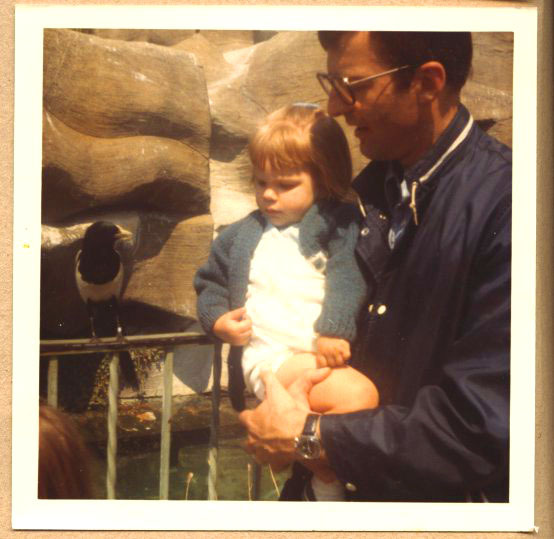 This is a picture of me with my father at the National Zoo (wearing the monogrammed cardigan that inspired Scarlett's blue sweater this year). Can you believe I was a blondie at that age? Three I'm guessing. The zoo seems to wrap up so many important things about childhood: wonder and play and love of animals and field trips with parents and grandparents, and, yes, naivete. I love children's book illustrations of the zoos of yesteryear with their parks and wrought iron and happy animals (for her birthday I gave Audrey A Sick Day for Amos McGee , which we are really enjoying). So I'm focusing on that. Will we sing "Happy Birthday"? Will you come? Say you will! Ask your mom if you may! Really cute! I love the theme. I can't wait for party photos. I too was a blondie who turned brunette. Beautiful invitations! I can't wait to see all the details you come up with for the rest of the party! Very cool Anneliese. You must have been super busy to make it work so well - with your big trip this year and all. 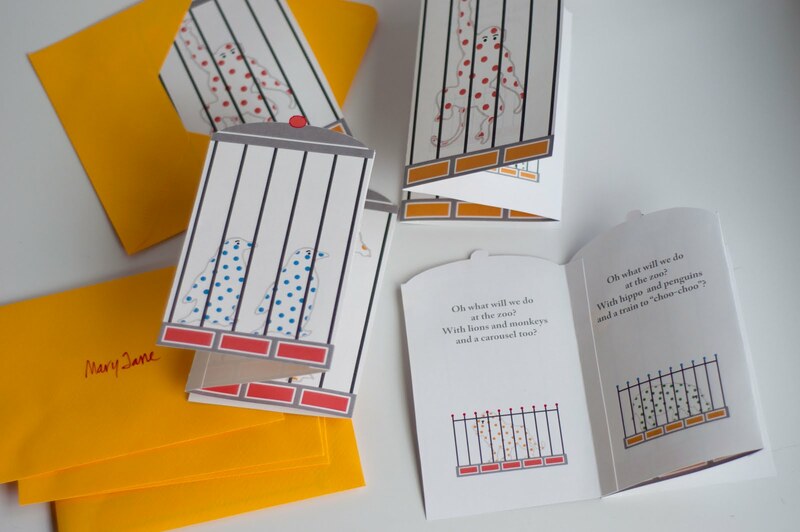 I am facenated to know what you use to produce your pictures that you used for the invites (and other things too, the baby shower cards for example). Hope Audrey has a wonderful day full of many memory making moments. Um... can you make them really sooN?! I want to order those invites!!! You are sucha great mama doing b-day parties for all your kiddos. I'm expecting #4 and my hubby and I came to the conclusion that we will do a bday party for the 1st Birthday, but after that... we'll throw a combined birthday party once a year for all the kids. A ZOO party seems like a party kids of all ages would love. What a great party idea! 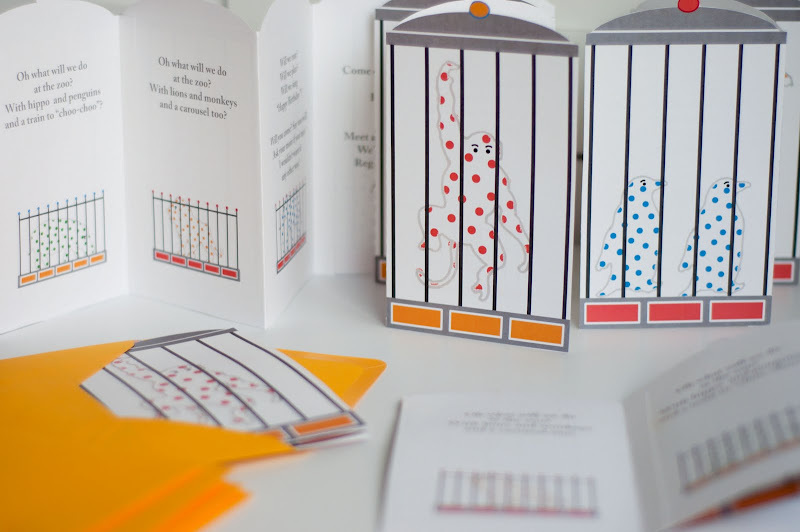 Those invites are so so cute! I would buy them! Seriously, the talent you posses, it is mind boggling! My daughter Hannah had a similar theme for her 5th birthday last year. We called it a Jungle party and all the children were allocated an animal - but they didn't have to dress up. When they arrived at our house we gave them hand made ears, tails/wings and painted their faces. It was fabulous. Complete with a crocodile pinata and zebra chocolate ripple cake. I don't know who had more fun, the children or me. Meags, that jungle party sounds like a blast! What a fun idea to have costuming waiting for the guests! These are adorable! 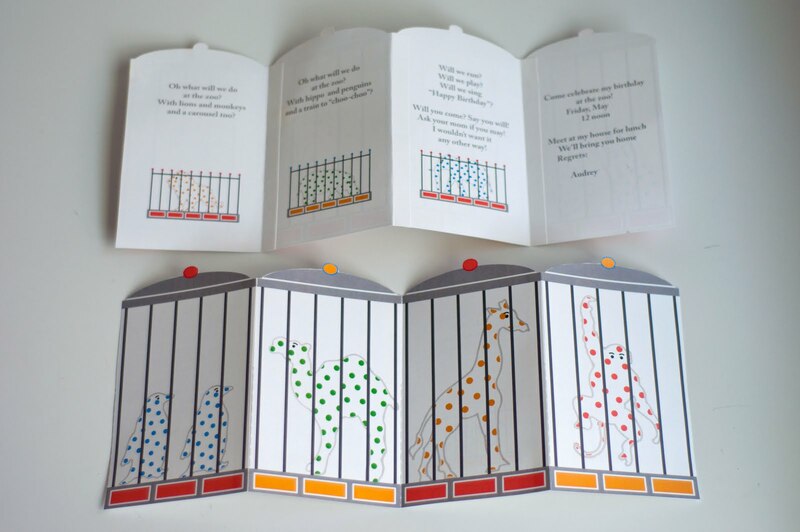 We are taking our little one the the zoo for the first time this weekend, I can't wait to see his reaction, I might be needing those invites for his second birthday! OK. Seriously. Will you adopt me? I know I am a little old, but I would like to think that there would be little work for you to do. Not interested? How about I just come and sit at the table while you create? I will be quiet. I promise! I think I need some of your talent!!! AMAZING! how did you make those? i am hosting a zoo party in one month and would love to do this.